While the Republican presidential hopefuls participating in Wednesday's debate disagree on many issues, there's one topic that unified the candidates: reproductive rights and, by extension, Planned Parenthood. Carly Fiorina's opinion on Planned Parenthood is the same as the other GOP candidates': that the organization should be defunded. Moderators Dana Bash and Jake Tapper asked the candidates their opinions on the Republican plan to defund Planned Parenthood entirely, with Bash noting that Texas Sen. Ted Cruz's plan to stop the organization's funding could cause a government shutdown in the next two weeks. One might assume Fiorina would take a more moderate stance on women's rights, as the only female candidate on stage, but her response to the question was just as harsh as her male counterparts'. Fiorina said in the debate that she would "like to link" two otherwise unrelated political issues — the Iran nuclear deal and defunding Planned Parenthood. Fiorina said that the Iran deal "has something to do with the defense of the security of this nation," while blocking abortion access "has something to do with the defense of the character of this nation." That's certainly an interesting use of rhetoric, but it's otherwise a pretty strange (and depressing) point for her to make. 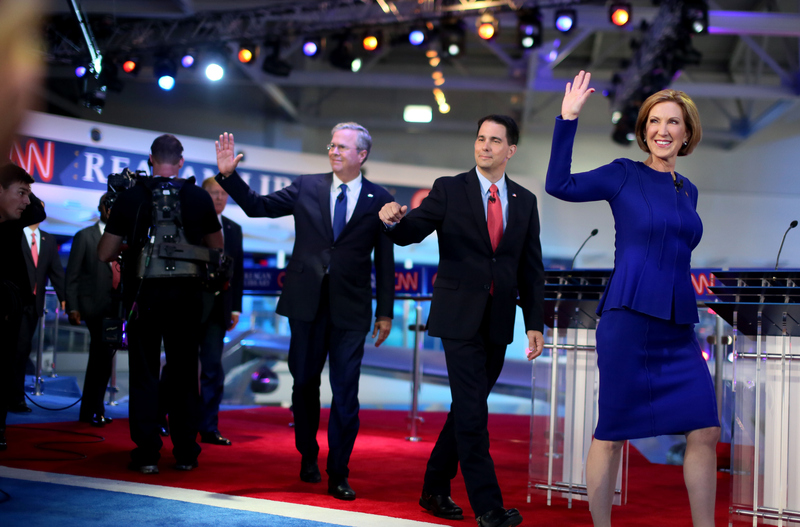 Fiorina's male counterparts offered similar statements about reproductive rights. New Jersey Gov. Chris Christie and former Florida Gov. Jeb Bush appeared to get into a tussle about which of them voted to defund Planned Parenthood first. Christie, who was pro-choice in the early 1990s, proudly stated that he "defunded Planned Parenthood" and vetoed funding for the women's health center in New Jersey. Bush was quick to follow up by adding that he defunded Planned Parenthood in Florida, as well. Cruz, meanwhile, went on a rant against the recent anti-choice videos that reportedly depict Planned Parenthood employees "selling the body parts of human beings," in Cruz's words. He went on to say that in America, it's a felony to sell fetal body parts for profit, something he believes Planned Parenthood does. Fiorina responded to Cruz's mention of the video as well, saying that it showed Planned Parenthood attempting to harvest the brain of a fetus that was still alive. "If we will not stand up and force President Obama to veto this bill, shame on us," Fiorina said, and her statement was followed by a round of applause. Christie, at least, recognized that the 11 candidates onstage shared similar viewpoints on abortion, saying that they shouldn't be "fighting with each other," and should instead be fighting with pro-choice Democrats, including presidential hopeful Hillary Clinton. In a sense, Christie was right — even though the candidates disagreed about the efficacy of a government shutdown, all of them stood against abortion. Fiorina's speech against Planned Parenthood in Wednesday's debate was another example of her conflicting brand of feminism. While Fiorina is a strong businesswoman whose debate performance proves she's got the staying power against a stage full of men, she doesn't support what many American women consider their basic rights.